In Nick Hornby's Songbook he includes Nelly Furtado's "I'm Like A Bird" as one of his current favourite songs, saying that it is one of the most infectious songs he's ever heard despite its completely simplistic nature. I would tend to agree with Hornby and I would even highlight her new single "Promiscuous Girl" with the same description. Almost completely absent are Furtado's trademark weird, somewhat annoying vocals, with this new single sounding more like M.I.A. if she was produced by Timbaland. 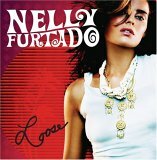 In fact, I never would have guessed that this was a Nelly Furtado song, but that's probably a good thing. For all the song's cheesy lyrics, simple beats and Furtado's pseudo-rapping (did she just name drop Steve Nash?? ), I can't help but be mesmerized by the song's completely overwhelmingly addictive sound. If you're just beginning to get sick of "I'm Like a Bird" you might want to check this song out.